Content: Nothing objectionable, but it’s slow to start and is a bit confusing. Not for the reader who gives up easily. It’s in the YA (grades 6-8) section of the bookstore. This has been on my shelves for a long time. Seriously. I had the ARC, but gave that up, and finally, again, decided that I really needed to read this one. And I was in the mood this past weekend to indulge myself. There’s three parts to this story. One is Oberon Venn, a very wealthy explorer who has spent the last two years in a depression because he was he cause of the accident that killed his wife, Leah. He will do anything to get her back. Including time travel. 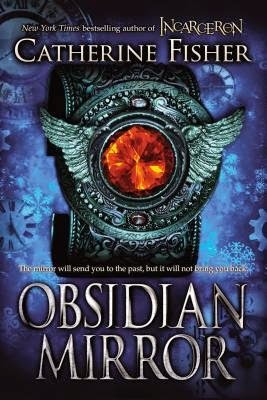 He and his trusty slave — there’s more to that than meets the eye — Piers are hidden out at Venn’s estate, trying to do just that: travel through time through the Obsidian Mirror. The second player in this drama is Jacob, the son of Venn’s best fried. Who is missing and presumed dead. Or at least that’s what Jake thinks. So he’s headed, along with his unsuspecting teacher, Wharton, to Wintercombe Abbey to force answers from Venn. Little does he know the web he will be tangled in. The final player is the most complicated one: Sarah is possibly an escapee from an insane asylum. Or perhaps she’s a traveler from the future, a future where the mirror has destroyed the world, in order to destroy the mirror and prevent Venn from bringing his wife back. There’s so much going on in this one, it’s hard to know where to begin. Yes, it’s slow and incredibly confusing to start with. I kept thinking “HUH?” But, I know Fisher’s work, so I stuck it out, and was richly rewarded. It’s time travel mashed with a mystery mashed with faery stories (yes, the Fey show up, and play a role), and if you give it time, it will begin to play out — it’s the first of a trilogy — in some incredible ways.